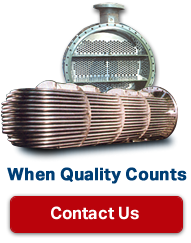 All tubular heat exchangers use tubes to act as the medium over which heat energy is transferred, but it is often overlooked how the process is separated: the tubesheets and endcaps. Adverse conditions within the vessel can wear and thin the surfaces over time, and even minor damage in the wrong place can cause big problems. 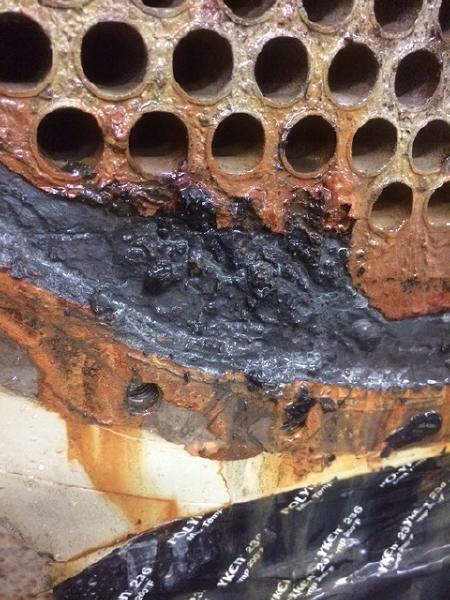 Erosion and corrosion that occurs around the sealing roll of the tubes can compromise the integrity of that seal, leading to unintended mixing of fluids which can be cause for shutdown and unexpected downtime. Repairing or replacing a significantly damaged tubesheet is both extremely costly and time-consuming, and can also require retubing depending on the damage sustained. This damage, however, can be mitigated or outright prevented, long before any risk of failure occurs. 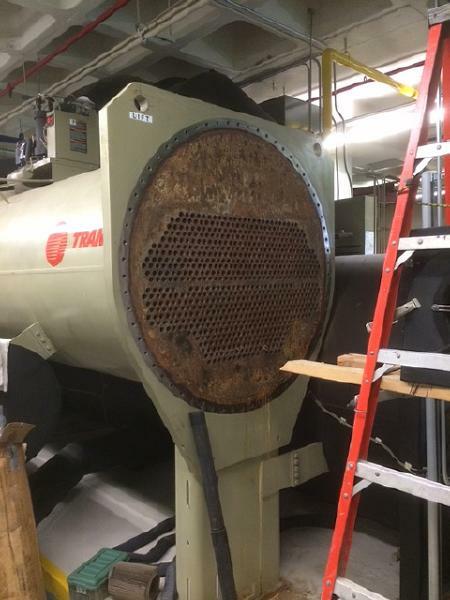 Coating exposed surfaces with materials like paint and epoxy is nothing new to most industries, and heat exchanger vessels are no exception. When a protective barrier is properly applied over exposed tubesheet and endcap surfaces, erosion and corrosion damage can be completely prevented. Even on already eroded surfaces, this protective coating can halt existing damage from getting worse. 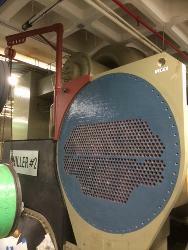 Furthermore, the coating can enhance the overall flow of fluid on the tube-side of the heat exchanger by reducing turbulence from buildup on the tubesheet surface. By extension, the coating can also prevent this buildup in the first place, which in turn keeps the tubes cleaner and less susceptible to damage. Condenser and Chiller Services offers a full epoxy coating service that utilizes Belzona products that can protect and restore your heat exchanger tubesheets and endcaps to look and perform better than new. We can perform this service either at your jobsite as part of a scheduled shutdown, or at our facility in Chino, CA. 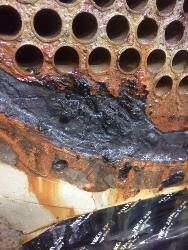 Our technicians first grit-blast all existing debris, rust, and fouling off the surfaces to be coated. 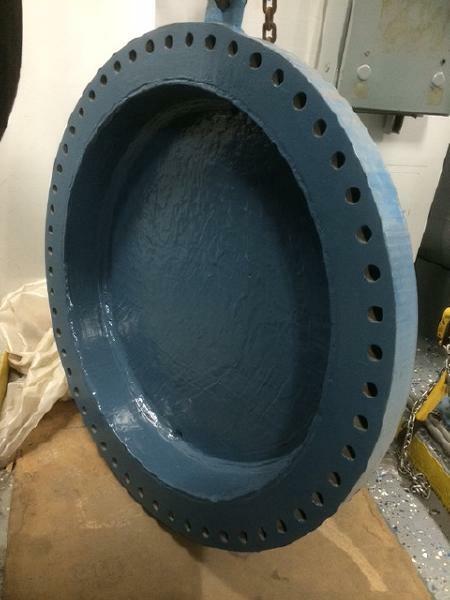 This will expose the bare, clean metal, free from any corrosion, rust, or scale. They will then hand-mix and apply the Belzona epoxy product to all surfaces to be coated, being careful to keep the epoxy out of the tubing. The product is applied in two colors, both to ensure full coverage of the surface, and also the proper thickness of the overall coating for its long-term durability. Should it be requested, we can also convert any gasket surfaces to use full-face gaskets, which allow not only for more uses of the gasket between changes, but also the prevention of cracking on the new epoxy coated surface. After allowing at least 24 hours of curing time, the newly coated surfaces will be ready for service.